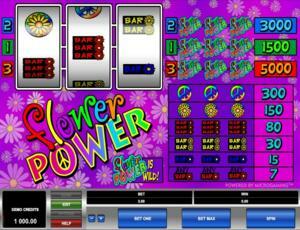 Flower Power is a classic online video slot game from Microgaming that has been released in November 1999. This online video slot machine game has 3 reels and 3 pay lines. The theme of Flower Power is inspired by the hippies of the 1960s wherein it was used as a slogan that symbolizes passive resistance and non-violence ideology. Did you know that Flower Power emerged as a movement for opposing the Vietnam War? The term was coined in 1965 by American beat poet Allen Ginsberg as a way to turn war protests into peaceful affirmative marches/spectacles. Hippies acknowledged the symbolism via dressing in clothes embroidered with flowers and bright colors, adorning flowers in their hair and clothes, and distributing flowers to the public masses, which made them known as the flower children. Many online slot players love playing this classic slot machine game as it brings out a genuine impression of a real land-based casino slot machine in every way. On the screen, you will see a bright purple layout of the game, with lots of flowers scattered everywhere. They even cleverly incorporated the peace sign as the letter “o” in the Flower Power logo. Most Microgaming online slot games are available in 2 formats. The first format is the one preferred by most players, which is the download format. The second format is the Flash or browser-based version, which means there is no need to download anything at all. Whether you like to download or not, Microgaming has slot games for all your slot gaming needs. Good thing that Flower Power is available for instant play, so you do not have to download anything to find out if this game interests you enough in a way that you would like to spend some real money on it. If you are a sucker for classic online slots and fully support the belief that love is more powerful than hate, then you will surely love spending some time playing the Flower Power online slot game as it features 3 reels and 3 pay lines, no fancy stuff to remember, a wild symbol, a maximum coin jackpot of 5,000, and a maximum cash jackpot of $25,000! The quality of the graphics and sound provided by Microgaming software is without doubt outstanding. They possess a track record of creating the most spectacular graphics and realistic sound effects. A lot of online slot players love Microgaming because its online slot games have smooth animation and amazing yet non-intrusive background music and sound effects. Since it is fundamentally a no-frills type of slot game, Flower Power has been designed to have a simple classic slot game with matching sound effects. The casing of the reels includes the reels, buttons and the payout table. The overall graphic design of Flower Power shows flowers strewn everywhere on a vibrant purple background. The symbols are bright, screams love and peace, and it’s really full of flowers. The entirety of the slot game is mostly purple in color. Other colors used in the game are green, red, blue, yellow, orange, black and white. In Flower Power, the background music and sound effects you will hear are very similar to the ones you will find in land-based casinos. Whenever you spin the reels, simple sounds common in land-based traditional slot games are played out; and when you manage to form winning combinations, soothing guitar music will be played out. There are no regular card deck symbols available in the Flower Power online video slot game. The regular symbols that you will find in the Flower Power slot game are the 3-Bar, 2-Bar, 1-Bar, the Flower, and the Peace Sign. The Wild Symbol is the Flower Power symbol. The Flower Power wild symbol acts as a substitute for all other symbols in order to you help you form winning combinations. Multiple Flower Power wild symbols on an active pay line will help you form winning combinations (please refer to the payout table). There is no Scatter Symbol in the Flower Power online slot game. Since Flower Power is a traditional, old-school 3-reel slots game, there are no bonus features in this game. Flower Power has 3 reels where you may bet on 3 pay lines. The minimum bet is 0.25 and the maximum bet is 5.00 per line. You can wager only 1 coin per pay line. Thus, the minimum amount you can bet is 0.25 and the maximum amount you can bet is 15.00 per spin. The maximum payout in the regular Flower Power online slot game is 5,000 coins. People who often play online casino games obviously love to stay longer on online slot games that have an Autoplay function. Good thing that Flower Power comes with this nifty function! In Microgaming online slot games, they have 2 game modes – Regular mode and Expert mode. You can have the game spin automatically for you with the Autoplay function that can be found by clicking the Expert button (located at the lower left portion of the game screen). • Spin 5x button – 5 consecutive spins will be automatically done for you. Autoplay will stop on any feature contained in this game. After customizing the Autoplay function to your preferences, just click on the Start button, and the game will automatically spin for you while you just sit back, relax, and enjoy playing this flowery, peace-loving and fun-filled online video slot game!